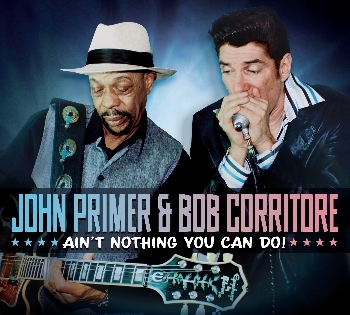 Blues vets Primer, Corritore reunite for Ain’t Nothing You Can Do! Despite the current political mood, this spring seems to be one of much collaboration in the blues music world, with new joint projects out or on the way from the likes of Taj Mahal and Keb’ Mo’, Charlie Musselwhite and Ben Harper, Guy Davis and Fabrizio Poggi, and Michael Ledbetter and Monster Mike Welch, to name a few. We’ll have more for you on some of those other projects in the weeks ahead, but thought we’d get things started with a reunion of two bluesmen we last heard Knockin’ Around These Blues together back in 2013, in guitarist John Primer (Muddy Waters Band) and harmonica ace Bob Corritore, who’s really banged out some terrific solo and duo albums in recent years, collaborating, for example, on releases with the likes of youngblood guitarist Big Jon Atkinson, veteran pianist Henry Gray, and longtime vocalist friend Tail Dragger. So it may not come as a big surprise that Ain’t Nothing You Can Do! (Delta Groove Music) also features a few other guest appearances. 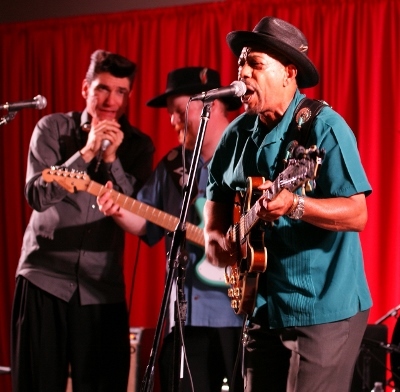 That includes both Atkinson and Gray on songs such as the swinging Chicago sound of “Hold Me in Your Arms” (Snooky Pryor) and a pair of Albert King numbers (a shuffling, almost “Crossroads”-like “For the Love of a Woman” and the gritty, steady-grooving title track), while the late Barrelhouse Chuck rides the keys on the remainder of the tracks, all of which are simply delightful and together help make for one of the most entertaining and authentic modern Chicago blues sessions you’ll have the pleasure of hearing, from the slunking instrumental original “Harmonica Boogaloo” and “Dust My Broom”-ish slide guitar riffs of “May I Have a Talk with You” (Howlin’ Wolf) to the opening, energetic “Poor Man Blues” and slow deep blues of the closing “When I Leave Home” with its soulful, B.B. King-style guitar licks, plaintive harmonica, and some fine playing from Barrelhouse Chuck, both Primer originals. Along the way, there are also terrific takes on songs such as Sonny Boy Williamson’s “Elevate Me Mama”, Magic Slim’s “Gambling Blues”, and “Big Leg Woman” (Johnny Temple, Muddy Waters) with its memorable lyrics of “you got somethin’ down there, make a bulldog hug a hound”. Primer, Corritore, and their guests are each masters of their instruments, with both the song selection and Primer’s vocals — which increasingly resemble those of his mentor and former bandleader Muddy Waters — helping to lend further credence to the project’s strong Chicago sound. Everything here is just superb, serving as excellent proof that Chicago blues are still very much alive and well. Ain’t Nothing You Can Do but enjoy it! This entry was posted in Albums and tagged Barrelhouse Chuck, Big Jon Atkinson, Bob Corritore, Henry Gray, John Primer. Bookmark the permalink.